My team and I have been supporting online learners since 2000. Originally this role was carried out by our Technical Team, but we found that most support requests (which come in the form of phone calls, emails and direct messages from our online Learning Management System) were not technical at all. The queries we receive usually relate to things like access rights, passwords or questions about certificates and, therefore, the role of supporting online learners was transferred to a dedicated Learner Support Team. However, we do, of course, still have the full assistance of the Technical Team whenever this is needed and our Quality Department ensures through the strict testing procedures that all our training material is of the highest standard. I love technology and like to find out how things work - when we release new functions to the system (which we do all the time) I like to work out how our learners can really benefit from the new functionality. Often companies will buy the Learning Management System so that they can not only use it for our courses, but also create their own courses (just for their company) by uploading their own questions and material (which could be in the form of SCORM content or PowerPoints or even Word docs). Everyone brings a new dimension and we are all learning all the time. I enjoy investigating and resolving more complex queries for our Learner Support Team and coordinating the pre-release Quality testing of our courses. Happy customers and great quality courses make my day! I am often the first point of contact for all our support emails and system messages and often it is simply a case of emailing or calling the learner with the answer to a question or query. I take pride in making sure that all the learners' queries are dealt with as quickly as possible to allow the learners to proceed with their training according to their plan. I love to hear about the sense of achievement a learner gets when they have successfully completed a course - especially if they have not been in a learning environment for some time. Sometimes I need to logon to the system to see just what the learner is seeing and I can often 'talk them through' from there. It feels good to be able to help our customers discover the online training and see how they enjoy the flexibility it gives. As part of my role I support Maria, Briony and the rest of the team. I often take part in the process of issuing Food Hygiene certificates and I support my team with answering telephone calls from our learners. I really enjoy helping our learners, answering any questions they may have. If there is a question about a Food Hygiene Certificate - then I am always happy to help. I work very closely with Learner Support Team. I am responsible for collating and analysing the post-course evaluation responses that we receive from thousands of our learners who completes the training every day and who let us have their comments. The opinions of our customers are very important to us as they help us to develop our products and services, so we are always very grateful for all learners feedback. I am often the first point of contact for all telephone calls and can deal with some enquiries myself. Sometimes people have not purchased a course yet, but just want to ask some questions before making the decision. I always ensure that if I cannot answer any customer enquires in full that they are transferred to the appropriate member of the team. I think a lot of people just like to know there is someone there if they need help and advice. Since launching Dialog Training in 1989, Dr Rosemarie Pearson, the prinicpal founder of Dialog, has worked with a wide range of businesses, charities and local authorities; including Arla Foods, Redbridge Borough Council, Nestle Water, the Royal British Legion, CocaCola Enterprises Ltd, Co-op Supermarkets and Anglia Crown Catering. Rosemarie and her team at Dialog believe in ensuring the training is fun interactive to suit all learners so they can apply it to their work and really make a difference. Food Dialog are a registered Training Centre with the Royal Society for Public Health (RSPH). Dr Verner Wheelock is Chairman of Verner Wheelock Associates, one of the UK’s leading providers of specialist training for the food sector. Verner has been in the industry for over 30 years, having spent time as a microbiologist, food engineer and head of the Food Science faculty at Nottingham University. Verner and his team believe that appropriate use of e-learning can bring benefits to us, by helping reduce our carbon foot print, through less travel, improved quality through consistency of delivery and improved customer service through providing a more flexible delivery model. As pioneers in e-learning, we use new technology to make the training and learning process more accessible, cost effective and enjoyable! 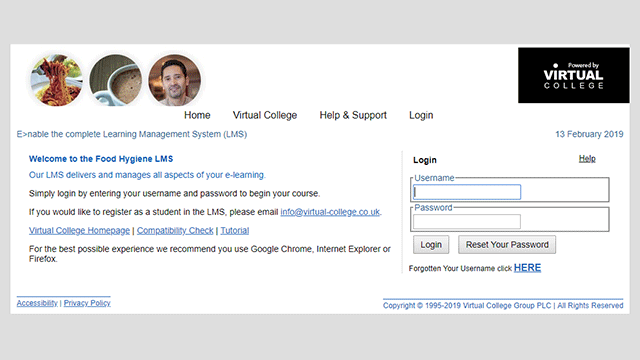 Since our formation in 1995, we have seen virtual learning take on an increasing role in enhancing training provision. Virtual College were pioneers of online food hygiene training and are still a market leader providing a training experience second to none. 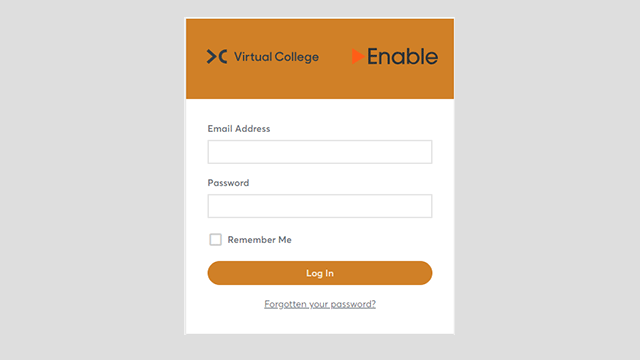 Virtual College have over 2 million online learners accessing our suite of online courses across many sectors. We have recently being voted e-learning development company of the year and the London Stock Exchange has selected us to be one of the 1000 companies to inspire Britain. Our customers include 60,000 learners in the NHS; 40,000 in other public sector roles; Housing Organisations; Engineering and Manufacturing sectors; Banking and Hospitality to name but a few, and over 80,000 learners have obtained their Food Hygiene Certificate via Virtual College online training and test. See www.virtual-college.co.uk for a full list of our other courses. Since starting the Virtual College as pioneers in e-learning in 1995, in response to a lack of available training provision within the electronics industry of which I was a Quality Director, I'm proud to say that we now have a first class Training Management System, 300 e-learning courses and over 2 million online learners.